So where are the Democrat leaders on this virulent anti Semitism emanating from their party? Why were there boos from their side of the aisle during the State Of The Union speech when Pres. Trump mentioned moving the embassy to Jerusalem? Where are Pelosi and Schumer to call out this vile behavior? And if they’re silent on this, why the outrage at a governor who dressed up 35 years ago in black face? Double standard?? Hey, who left all these post-it notes of support outside Rep. Ilhan Omar’s office? 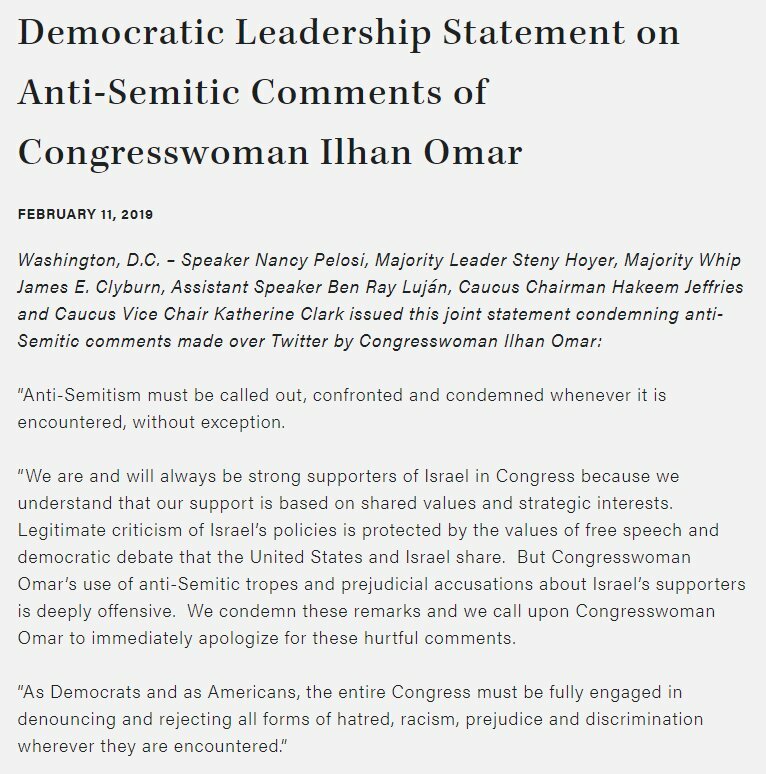 Posted at 5:51 pm on February 11, 2019 by Doug P.
Democrat Rep. Ilhan Omar has apologized-but-not-really after Nancy Pelosi and other Dems issued a strongly-worded but toothless statement about her most recent anti-Semitic remarks. Democrat Jews are starting to see the light. As for the ones who aren't, keep an eye on who they are for the future. It’s all about the Benjamins baby. After this and the women's March, can the liberal amothers admit there is an antisemitic problem in the democratic party? The leadership put Ilhan Omar on the education and foreign affairs committee. It shows you how much they value Jews. Don't forget Kate Perry's blackface shoes. I wouldn't worry too much about white genocide. I would worry when disgusting and offensive clothing like that becomes mainstream. Fortunately, people object to that ... and to antisemitic clothing. Unless, of course, that doesn't bother you either. Big flipping deal. This statement came after the Jews in Congress condemned her. This isn't a statement originating from them. They waited instead of reacting right away. Democratic leaders are in bed with antisemites. Despite her prior antisemetic statements, they put her on the Foreign Affairs Committee. Do you think Israel can get a fair shake from her? DEMOCRATS HAVEN'T CONDEMNED ILHAN OMAR! Sure they have. Here you go. UMMM. NOW I'M GOING TO COME UP WITH ANOTHER EXCUSE TO SAY BAD THINGS ABOUT DEMOCRATS. 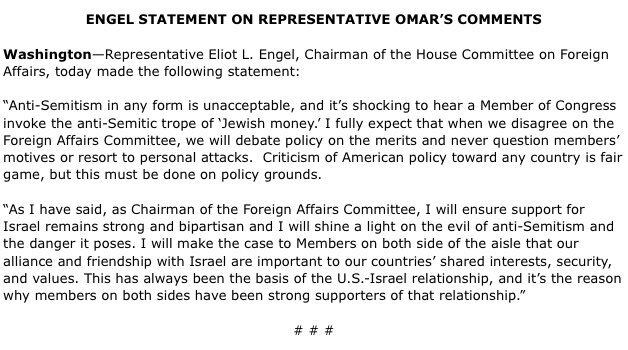 Rep. Omar seems to be apologizing now for the "all about the Benjamins" tweet after being condemned by the House leadership. While I tend to believe there should be a statute of limitations on stupidity, Governor Northam's ever-changing response troubles me. First, this was not high school; he was 25 years old at the time. Second, while 1984 may seem like a long time ago to many of you, I can assure you that people were quite well aware in 1984 that blackface and KKK robes were too hot to handle. In fact, I recall while I was in college around the same time, the Panhellenic Association, the governing body of the fraternities and sororities, gave annual sensitivity training to officers of the member organizations. However, these are mere quibbles. I'd be happy for Rep. Omar to peddle her anti-Semitic worldview and for Gov. Northam to dress up however he wants were it not for the complicity of the legacy media. Rep. Omar's beliefs about Jews are no secret. Laura Loomer did plenty of reporting on this before the 2018 elections, and she was roundly ignored on both sides of the aisle. Everyone -- Republicans and Democrats alike -- were so eager not to be accused of Islamaphobia that they literally ignored the overwhelming evidence. Gov. Northam's misdeeds only got attention when his remarks about infanticide disturbed not only pro-life supporters but many pro-choice advocates as well. Suddenly, the media switched the focus almost exclusively to the yearbook photo. Just keep in mind that the "independent press" would never have uncovered or reported any of these stories on their own. Were it not for social media and independent journalists and activists, we would never know. The Jews in Europe also didn't worry too much about Jewish genocide and look where that led..
Anti-semitic clothing is different than regular clothing deemed to be "blackface". Ski masks are common and not considered blackface so the sweater with half a ski mask shouldn't offend anyone as it is clearly not blackface. And the shoes are adorable, I don't understand the blackface part of it at all. That is especially since there have been complaints that some things arent made in the black version leaving black people left out of things white people enjoy. For example, bandages aren't black and dolls werent black etc. So now that black versions are included and being sold they complain about that as well. If they wouldn't have been included then there would be complaints about that as well. White people are walking on eggshells. Damned if they do and damned if they don't. How far is it going to go before there is white genocide? They appointed her to several prestigious committees. "It's all about the Benjamins, baby" is not a change in sentiment for her. It's her being her. There is not one Democrat on this site who admitted that they were wrong to participate in the antisemitic lead Womens March. I don't need to say bad things about democrats. They are doing it themselves. Their hypocrisy and prejudice is blatantly obvious even with the media on their side. If you don't see a problem with that Gucci sweater, I'd suggest that you do some reading up on blackface. I also suggest that you take your head out of the sand and learn about white privilege in this country. Simply put, there is no risk of "white genocide." In the meantime, however, black parents still have to talk to their children about the risks of walking or driving while black. Ok, here we go again. All the women's marches were on shabbat. No one on this site participated. Ergo they can't admit they're wrong. "When did you stop beating your wife, Mr Smith?" I still haven't seen you admit that you're wrong about the hats. That they are indeed cats, and not genitalia. He never made remarks about infanticide. That's just a Republican fabrication. And while he should be called out for blackface, its the height of hypocrisy for Republicans -- who have repeatedly re-elected Steven King (and put up with his racism in Congress for 15 years without so much as a peep), and who elected a Republican who traded on the blatantly racist "birther" lied about President Obama, not to mention his comments about Judge Curiel, about Latin Americans, about Muslims, ad nauseum -- to be talking about it. And I'm looking for equal condemnation of Thomas K. Norment Jr. And Tate Reeves. And others. But of course you're changing the subject, since the Democrats have condemned Omar. As you're not white you don't have to worry. Orange Amother, you're out of line. First of all, you are in violation of Imamother TOS when you make inflammatory accusations under the guise of Amother. Second of all, my post contained absolutely nothing regarding Republican versus Democratic divisions. You are the one who brought that up. I regularly condemn Republicans, and you just are regularly ignore it because it doesn't fit with the image you've created of a fire-breathing, troglodyte conservative.